Check out Sam’s latest notepad design! Sam’s our designer who creates the artwork for our customer samples & promotional items. 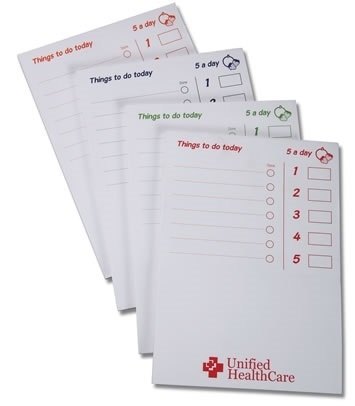 Slim To-Do Notepads are always handy – and this new artwork design helps us keep track of key jobs to do each day & there’s space to jot notes from phonecalls etc too. Available in any colour to match your company or logo colour from just 100 units. Wrap-around design prints for a lasting impression!